At the end of the year, I perform tax loss harvesting to get a larger tax return in the following year. I usually try to hit -$3000 in net losses, which in my tax bracket allows me to get +$1000 back on my tax refund (state + federal). You can only claim up to -$3000 in net losses per year and any more can be moved forward to the next year. Last year I had around -$4000 in losses so I carried forward -$1000 which can be used this year. I don't have any other names worth considering since it's not economical due to commissions. Give or take this is only around -$1500. Frankly, my portfolio does not have as many losses as gains. The other option I have is to just not do any selling this year for tax loss harvesting and keep those 6 high quality companies I listed above since they are all doing very well still. I can carry forward the -$1000 from last year and offset this year's +$1869 gains to only be a net of $869. I will have to pay tax on this amount and I guestimate after all of my tax deductions it may be around $260 that I have to pay the IRS. There are several negatives with tax loss harvesting. One is you will be out of your position for at least 30 days. If your position rises then you will not benefit unless you find an equity that performs in lockstep. The second issue is that tax loss harvesting lowers your basis even further. If you sell the stock at a loss and then purchase it back 30 days later at the same price you sell it, you will have a lower cost basis than you started with. In the future if you decide to sell the shares, you will have a higher tax to pay due to the lower cost basis. The other disadvantage is commissions. Selling 6 companies will cost for most brokerages 6x $7 = $42 in commissions. Tax loss harvesting is usually accompanied by buying as well since most investors want to stay invested. Commissions can total $100 for a scenario like this which isn't cheap. In the end I am leaning towards not doing anything for 2016 and just using my carry over -$1000 from last year to offset my gains in 2016. Disclaimer: Before taking any action on your assets, please consult with your tax advisor on what course of action is best suited for your investment plans. I'm a bit late to post this and have been inactive for some time. I have been on travel overseas and now I have some more time to post about my progress. 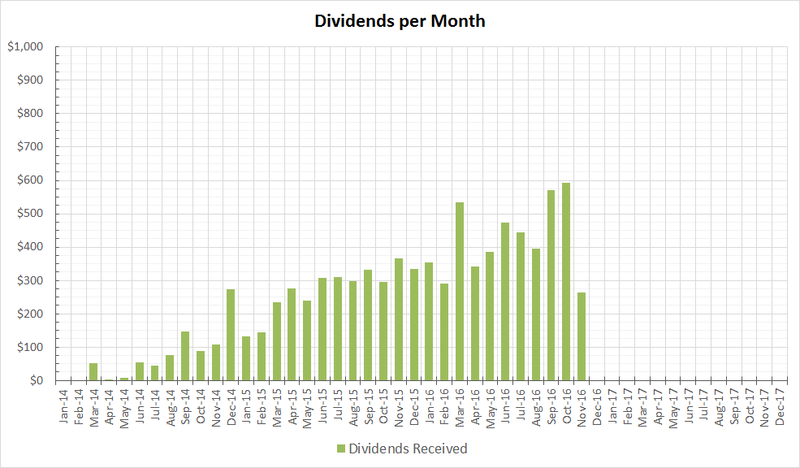 I will give a summary of my dividends in this post and shortly after I will post my portfolio updates for the month of November 2016. I re-balanced my portfolio several months ago. 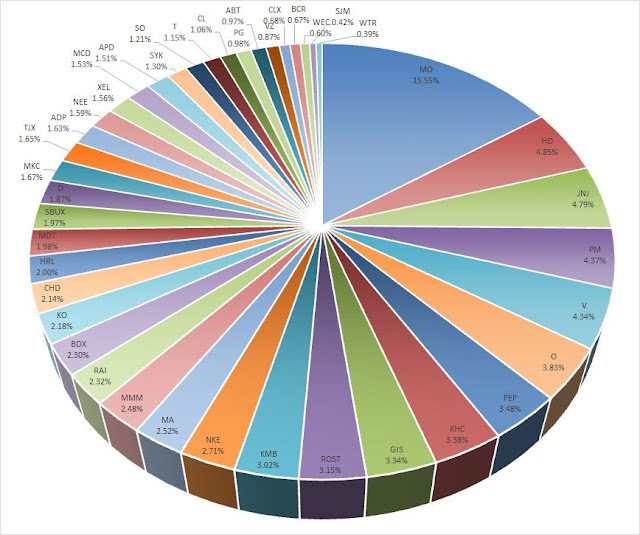 Due to the movement of positions, November does not have many dividends. My Feb, May, August, November months have less dividend paying companies at the moment. Most of my dividend checks will be received in Jan, April, July, October. For the upcoming December I am expecting around $500 and January I am looking at around $830 in dividends. 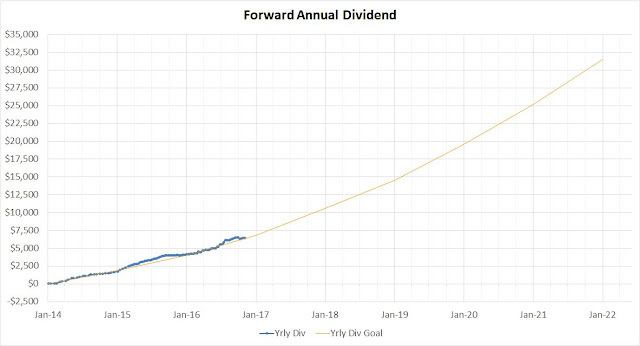 Overall, the moving average of dividends received is growing slowly upwards. This $1000 yields on average 3.55% which will add $35.5 to my yearly income. The purpose of this blog is to document my journal to accumulate passive income. If an investor wants to become independent, he needs to make sure that he has several sources of income. Many people today rely purely on their primary vocation for financial support. Having worked in the tech industry for several years, I have seen many of my colleagues given the "pink slip" as companies reduce their expenses. One's employment is never guaranteed and this is very scary indeed. One's consistent paycheck from his employer should never be taken for granted. In order to take control of one's life, a person must become an employer (or business owner) and not remain as an employee forever. As an employer, you own assets and people that produce income for you. You keep a portion of the profits from a profitable enterprise. The employees are there to work for you to bring in profit and you will pay the employees a small portion of your profits to ensure they come in to work the next day. In the future, I want to be on the side of the employer or shareholder or business owner. I do not want to remain an employee forever since the accumulation of wealth is only linear as an employee (based on hours worked and wage) while the accumulation of wealth for a capitalist is exponential. My current goal as an employee is to accumulate as many businesses as I can to pay for my living expenses. The market was rather shaky in October. 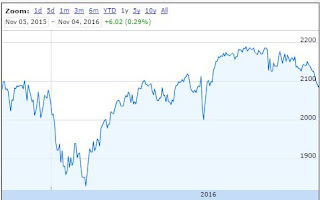 From what I've noticed, September and November have often been volatile months with the indexes often dropping several percentages. It seems this year that the volatility is continuing into November as well. Part of my reasoning is that the elections are coming up in a few days and there is large uncertainty. 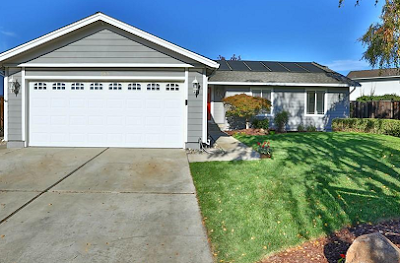 There is also the Federal Reserve decision in December which many believe will be a hike to the interest rate. For the month of November, the Federal Reserve decided not to hike the interest rate. I believe also that many of the companies that are not doing so well this year will continue to drop as the year ends. Many people are looking to perform tax loss harvesting including me. Those people will sell the losers to reduce their taxable income. I pasted the charts below for the S&P500 index, the crude oil prices, and the dollar index. My portfolio follows similarly to the S&P500 index because my portfolio is very diversified. I would say my portfolio rises and falls less than the S&P500 (less volatility) because of my larger weighting in consumer staples and my low exposure to technology, banks, and industrials. The oil price is shown because today's market often times follows the price of oil. Oil is seen as a demand indicator and when oil prices fall, institutional investors often sell. This is rather contradictory since lower oil prices will help many companies since oil is a basic commodity that companies use to produce their goods and services. 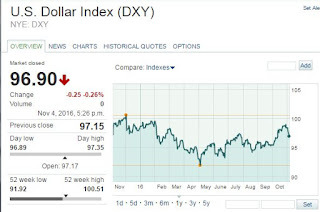 The dollar index is shown because a strong dollar will have a negative effect on many of my companies that are multinational. A strong dollar means less sales overseas since our goods are more expensive for foreigners to purchase. The S&P500 is correcting. Although this may be seen as bad news for most people I welcome this change. It allows me to purchase companies at a large discount. The yield will also now be higher for many of the dividend aristocrats I follow. 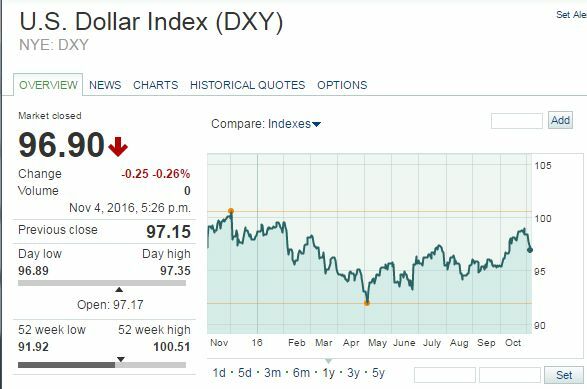 The US dollar has risen in October but is largely stabilized around 95. 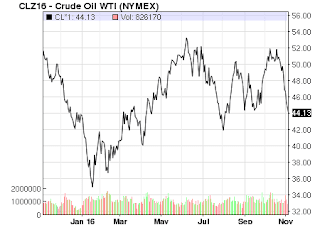 Crude oil prices have taken a tumble lately. I am not invested in energy or oil stocks anymore so this is not something I am too bothered with. My portfolio at the end of October is trailing a bit below $1/4 million. I seem to be having some difficulty going off the 1/4 million mark and it's largely due to the market uncertainty and selling happening before the 2016 election and December Fed hike decision. My positions are sorted from highest to lowest. The right columns of the table show the S&P credit rating (AAA being the best), the Value Line Financial Strength rating (A++ being the strongest), and the Value Line Safety rating (1 being the safest). My general guideline in investing is to buy high quality. It is better to pay more for a few extraordinary high quality company than to buy a lot of cheap good companies. The portfolio's goal is income accumulation. All of my companies pay dividends and all of them raise the dividend every year. The coverage of that dividend is paramount and I do everything in my power to ensure the companies are safe in covering their dividends. My largest weightings are in consumer staples. These companies are corporations that make products we use everyday, which is why they are called staples. These include stuff like water and drinks, food, shampoo, toilet paper, toothpaste, cigarettes, food spices, and laundry detergent. They are not high flying growth stocks but they do continuously grow their dividends and are readily capable of covering their dividends due to the anti-cyclical nature of their business. The majority of my portfolio are in positions I would classify as Core or Super Core. These business are ones I can trust for the long term. I don't see many of these going out of business any time soon since they offer products and services we all need no matter the economic situation. Supporting and Speculative positions are usually companies that I classify as less robust but may offer larger capital gain growth than my Core positions. I try to balance my portfolio between super growth and steady payers. 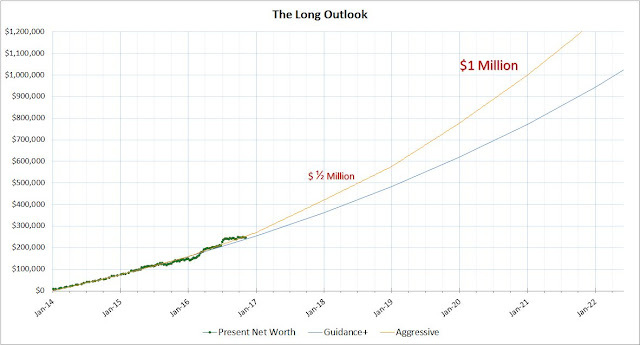 Here is the graph showing my progress so far to reach $1 million. With $1M I hope to have a 2.6% average yield on my portfolio which is around $26,000 a year in passive income from my assets. My portfolio has been flat for several months because the market has been falling and I have been able to offset that with my periodic contributions. 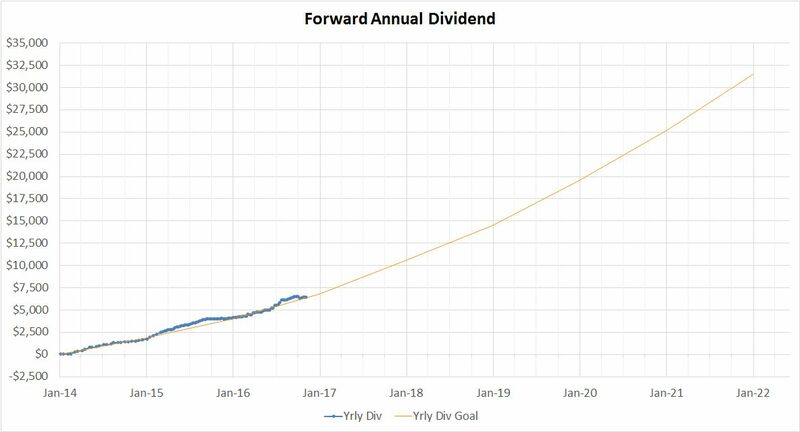 Although my portfolio has been going no where, my dividends have been growing as seen in the plot below. One must remember as a dividend growth investor that the ultimate goal is income accumulation, not share price accumulation. Share price accumulation is only icing on the cake to income accumulation. Usually, when companies increase their dividends, their share price will rise along with it but this is often an after effect of the business being successful. As long as my portfolio's dividend income continues to rise, I am content. If my income is dropping because my companies have to cut their dividend, then I will become concerned. Stay tuned for next month's update.